For a society accustomed to the achievements of a linear economy, the transition to a circular economic system is a hard task even to contemplate. Although the changes needed may seem daunting, it is important to remember that we have already come a long way. However, the history of the waste hierarchy has taught that political perseverance and unity of approach are essential to achieving long term visions in supply chain management. Looking back, it is helpful to view the significance of the Lansink’s Ladder in the light of the sustainability gains it has already instigated. From the outset, the Ladder encountered criticism, in part because the intuitive preference order it expresses is not (and has never been put forward as) scientifically rigorous. Opposition came from those who feared the hierarchy would impede economic growth and clash with an increasingly consumerist society. The business community expressed concerns about regulatory burdens and the cost of implementing change. However, such criticism was not able to shake political support, either in Holland where the Ladder was adopted in the Dutch Environmental Protection Act of 1979, or subsequently across Europe, as the Waste Hierarchy was transposed into national legislation as a result of the revised Waste Framework Directive. Prevention, reuse and recycling have become widely used words as awareness has increased that our industrial societies will eventually suffer a shortage of raw materials and energy. So, should we see the waste hierarchy as laying the first slabs of the long road to a circular economy? Or is the circular economy a radical new departure? (+) Progressive development of circular economy models, with increasing awareness of social, financial and economic barriers. (-) Conservation of the principle of ownership, which hinders the development of the so-called ‘lease society’. As the direction, scale and weight of these drivers are difficult to assess, it’s necessary to steer developments at all levels to a sustainable solution. The second transition taught that governmental control appears indispensable, and that regulation stimulates innovation so long as adequate space is left for industry and producers to develop their own means of satisfying their legislated responsibilities. The European Waste Framework Directive has been one such stimulatory piece of legislation. Unfortunately, the EC has decided to withdraw its Circular Economy package, which would otherwise now be on track to deliver the additional innovation needed to achieve its goals – including higher recycling targets. Messrs. Juncker and Timmermans must now either bring forward the more ambitious legislation they have hinted at, or explain why they have abandoned the serious proposals of their predecessors. Perhaps the major differences between Member States and other countries may require a preliminary two-speed policy, but any differences in timetable between Western Europe and other countries should not stand in the way of innovation, and differences of opinion between the European Parliament and the Commission must be removed for Europe to remain credible. Governmental control requires clear rules and definitions, and for legislative terminology to be commensurate with policy objectives. One failing in this area is the use of the generic term ‘recovery’ to cover product reuse, recycling and incineration with energy recovery, which confuses the hierarchy’s preference order. The granting of R1 status to waste incineration plants, although understandable in terms of energy diversification, turns waste processors into energy producers benefiting from full ovens. Feeding these plants reduces the scope for recycling (e.g. plastics) and increases CO2 emissions. When relatively inefficient incinerators still appear to qualify for R1 status, it offers confusing policy signals for governments, investors and waste services providers alike. The key role for government also is to set clear targets and create the space for producers and consumers to generate workable solutions. The waste hierarchy’s preference order is best served by transparent minimum standards, grouped around product reuse, material recycling or disposal by combustion. For designated product or material categories, multiple minimum standards are possible following preparation of the initial waste streams, which can be tightened as technological developments allow. As waste markets increase in scale, are liberalised, and come under international regulation, individual governmental control is diminished. These factors are currently playing out in the erratic prices of secondary commodities and the development of excess incinerator capacity in some nations that has brought about a rise in RDF exports from the UK and Italy. Governments, however, may make a virtue of the necessity of avoiding the minutiae: ecological policy is by definition long-term and requires a stable line; day to day control is an impossible and undesirable task. The road to the third transition – towards a circular economy – requires a new mind-set from government that acknowledges and empowers individuals. Not only must we approach the issue from the bottom-up, but also from the side and above. Consumer behaviour must be steered by both ‘soft’ and ‘hard’ controls: through information and communication, because of the importance of psychological factors; but also through financial instruments, because both consumers and industry are clearly responsive to such stimuli. Where we see opposition to deposit return schemes, it comes not from consumers but from industry, which fears the administrative and logistical burden. The business community must be convinced of the economic opportunities of innovation. Material supply chain management is a challenge for designers and producers, who nevertheless appreciate the benefits of product lifetime extensions and reuse. When attention to environmental risks seems to lapse – for example due to financial pressures or market failures – then politics must intervene. Government and industry should therefore get a better grip on the under-developed positive drivers of the third transition, such as eco design, secondary materials policy, sustainable energy policy, and research and development in the areas of bio, info, and nanotechnologies. Good supply chain management stands or falls with the way in which producers and consumers contribute to the policies supported by government and society. In order that producers and consumers make good on this responsibility, government must first support their environmental awareness. ‘Seeing is believing’ is the motto of followers of the Apostle Thomas, who is chiefly remembered for his propensity for doubt. The call for visible examples is heard ever louder as more questions are raised around the feasibility of product renewal and the possibilities of a circular economy. Ultimately, the third transition is inevitable as we face a future of scarcity of raw materials and energy. However, while the direction is clear, the tools to be employed and the speed of change remain uncertain. Disasters are unnecessary to allow the realisation of vital changes; huge leaps forward are possible so long as government – both national and international – and society rigorously follow the preference order of the waste hierarchy. Climbing Lansink’s Ladder remains vital to attaining a perspective from which we might judge the ways in which to make a circle of our linear economy. Note: The article is being republished with the permission of our collaborative partner Isonomia. The original article can be found at this link. Biomass resources have been in use for a variety of purposes since ages. The multiple uses of biomass includes usage as a livestock or for meeting domestic and industrial thermal requirements or for the generation of power to fulfill any electrical or mechanical needs. 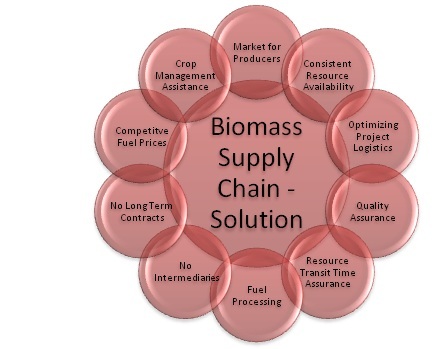 One of the major issues, however, associated with the use of any biomass resources is its supply chain management. 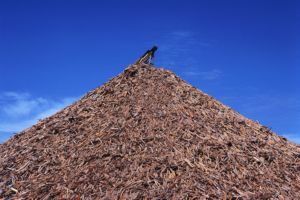 The resource being bulky, voluminous and only seasonally available creates serious hurdles in the reliable supply of the feedstock, regardless of its application. The idea is thus to have something which plugs in this gap between the biomass resource availability and its demand. The supply chain management in any biomass based project is nothing less than a big management conundrum. The complexity deepens owing to the large number of stages which encompass the entire biomass value chain. It starts right from the resource harvesting and goes on to include the resource collection, processing, storage and eventually its transportation to the point of ultimate utilization. Owing to the voluminous nature of the resource, its handling becomes a major issue since it requires bigger modes of logistics, employment of a larger number of work-force and a better storage infrastructure, as compared to any other fuel or feedstock. Not only this their lower energy density characteristic, makes it inevitable for the resource to be first processed and then utilized for power generation to make for better economics. All these hassles associated with such resources, magnify the issue of their utilization when it comes to their supply chain. The seasonal availability of most of the biomass resources, alternative application options, weather considerations, geographical conditions and numerous other parameters make it difficult for the resource to be made consistently available throughout the year. This results in poor feedstock inputs at the utilization point which ends up generating energy in a highly erratic and unreliable manner. Although most of the problems discussed above, are issues inherently associated with the usage of biomass resources, they can be curtailed to a larger extent by strengthening the most important loophole in such projects – The Biomass Resource Supply Chain. World over, major emphasis has been laid in researching upon the means to improve the efficiencies of such technologies. However, no significant due diligence has been carried out in fortifying the entire resource chain to assure such plants for a continuous resource supply. The usual solution to encounter such a problem is to have long term contracts with the resource providers to not only have an assured supply but also guard the project against unrealistic escalations in the fuel costs. Although, this solution has been found to be viable, it becomes difficult to sustain such contracts for longer duration since these resources are also susceptible to numerous externalities which could be in the form of any natural disaster, infection from pests or any other socio-political or geographical disturbances, which eventually lead to an increased burden on the producers.